Chuck Hill is a fifth generation Henderson County resident. He purchased his first camera at a pawn shop in Fayetteville while stationed at Fort Bragg NC with the 82nd Airborne Division.� He is a member of the Professional Photographers of North Carolina (PPNC) and the Professional Photographers of America (PPA).� He has been a recipient of the PPA Photographer of the Year Award.� He has won numerous other awards for his scenic and portrait photography and has placed several images in the prestigious PPA and PPNC loan collections.�Chuck has been a professional photographer for 30 years.� He and his wife, Wendy, own and operate Chuck Hill Photography in Hendersonville, North Carolina. Class is limited to 10, so call 800-277-9611 today to reserve your spot. 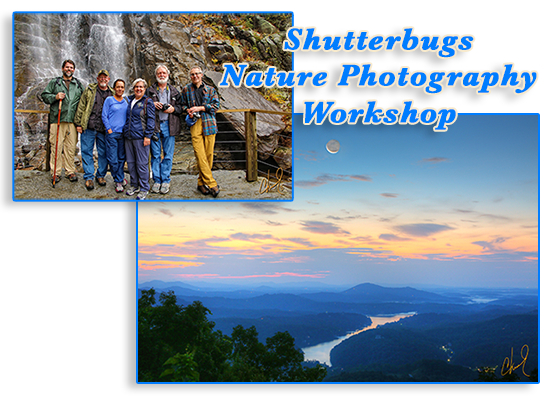 The deadline to register for this workshop at�ChimneyRockPark.com�is Thursday, April 22, at midnight. Cost is $250 per participant, plus $8 to camp overnight in the Park.